Nick Foles, Aaron Rodgers, Jamaal Charles and Andy Dalton — is there reason why any of them couldn't run the table to the Super Bowl? The dust is settled and the field is set. The Chargers shouldn’t be in (if you ask Steelers fans). The Eagles shouldn’t be in (if you ask the Tony Romo nuts out there). And just how did the Packers get in again?!?!?! Some of the game’s biggest names (Tom Brady and Peyton Manning) and youngest guns (Russell Wilson and Cam Newton) have the weekend off, but there will be no shortage of excitement on wild-card weekend. And each game, from the Chiefs trying to prove they are for real and the Bengals trying to prove the can actually win a playoff game, to the Saints trying to prove they can win outdoors and the Packers trying to — finally — beat the 49ers, will provide more drama than any "reality" show about dynasties could ever drum up. And beyond the drama is the history lesson — at least one team that played on wild-card weekend has made the Super Bowl in each of the last three postseasons and seven of the last eight. Here’s a first look at each game (all times Eastern). But for all of the questions that have dogged Smith since he entered the league as the No. 1 overall pick ahead of Aaron Rodgers in 2005, he is also on a hell of a three-year run. Since the beginning of the 2011 season, Smith is 30-9-1 as a starter in the regular season, 1-1 in the playoffs. He also makes this game noteworthy for one other reason — this is the only wild-card game pitting a pair of QBs selected No. 1 overall against one another. And just for laughs, the last time two No. 1 overall pick QBs faced off in the playoffs? The 2012 NFC Championship Game, when Eli Manning and the Giants beat . . . yup, Alex Smith and the 49ers. As mentioned, this season was perhaps Smith’s best. His 89.1 passer rating is not a career best, but he set career highs in attempts, completions, yards and TDs. But that darn passer rating . . . As for the No. 1 pick across from Smith? Second-year man Andrew Luck entered the NFL with much loftier expectations (as in, best QB prospect in draft history expectations). And while he has looked very much like the franchise QB most expected, his numbers are not much different than Smith’s this season. He threw for 509 more yards, but played in one more game and threw the same number of TDs and two more picks than Smith. And he’s one of those four playoff QBs with a worse passer rating than Smith. Both teams sport defenses that get after the QB (both had more than 40 sacks), are in the top 10 in scoring defense but struggle to stop the run. Basically, we have a matchup of solid, aggressive defenses against QBs who rarely make mistakes and exploit their opponents with their running game and their defenses more than the long ball. The Chiefs sport an MVP candidate in Jamaal Charles (1,287 rushing yards, 5.0 YPC, 70 catches, 693 receiving yards, 19 total TDs). The Colts sport a pair of first-round picks in the backfield who thus far would have to be considered busts (Donald Brown, first-round pick in 2009; Trent Richardson, first-round pick by Cleveland in 2012 acquired via trade this season). In five seasons, Brown has as many TDs as Charles had this season. Richardson averaged less than 3 yards a carry in Indy and has scored two TDs since September. But two weeks ago, the Colts hammered the Chiefs 23-7 — in KC. Vegas views the teams as even, they are listed at equal 30-1 odds to win the Super Bowl. If the wild-card round plays out according to seed, the winner of this game will play the Broncos in the divisional round. The Chiefs lost twice to the Broncos; the Colts beat Denver this season. At least we know who Peyton Manning is probably cheering for. What you should know: Drew Brees is officially on the clock — and under the gun. As the Saints QB will be more than happy to tell ya, the Saints are a great road team. In fact, according to Brees, the Saints have the best road record in the NFL dating back to some year that pretty much has no bearing on what the Saints have done on the road this season. Why? Because while the Super Bowl XLIV-winning Saints were 7-1 on the road, the 2013 NFC South runner-up Saints are a woeful 3-5 on the road, losing to the likes of the Patriots (OK, we can accept that), the Seahawks (nothing wrong with that), the Rams (OK, now we’re worried), and the Jets — the JETS!!! — the J-E-T-S-W-T-F?!?!?! So while you’ll see plenty of chatter about LeSean McCoy vs. Rob Ryan’s defense, Nick Foles and Chip Kelly’s inexperience in the playoffs, and the Saints’ kicking troubles, this may all boil down to Brees and his high-flying offense against Mother Nature. The early forecast for Saturday in Philadelphia calls for sunny skies — but a high south of 30 degrees. Hopefully for New Orleans, there’s not a repeat of the Week 14 weather in the City of Brotherly Love. 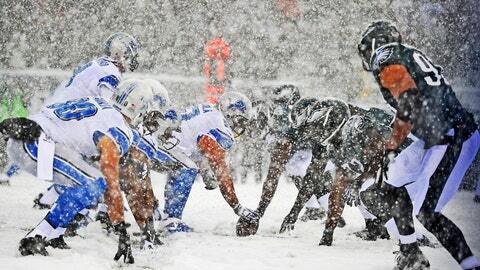 If conditions in Philadelphia next weekend are anything like this Dec. 8 game between the Eagles and Lions, Drew Brees could be in for a short postseason. Drew Brees is Drew Brees. And for the third consecutive season, he threw for 5,000 yards. The Eagles sport the NFL’s WORST pass defense. Kyle Orton — yes, Kyle Orton — threw for 358 yards in the regular-season finale Sunday night, with a playoff spot on the line. The Eagles won the game with a late interception by Brandon Boykin — yes, Brandon Boykin. If the weather’s right, you think Brees can put up 385 on the Eagles, and maybe not throw a killer INT? What you should know: Fear the Black and Orange. 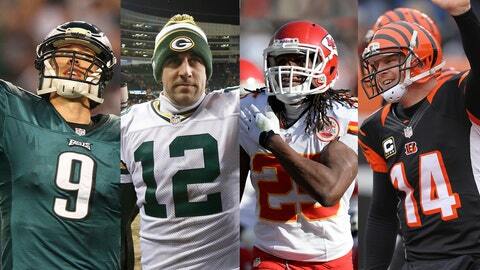 Quick, who has the biggest home-field advantage in the NFL? The Saints went 8-0 at home, but they play on the road this coming weekend. The Seahawks? Their crowd makes a lot of noise, but losing to the Cardinals in Week 16 sorta puts a taint on that. How about the Bengals? Yeah, the Bengals. Cincinnati is the only host team this weekend which ran the table at home. And the Bengals are sure looking scary right now. How scary? On Sunday, QB Andy Dalton threw a whopping four interceptions and they committed 10 penalties — and still doubled-up the Ravens 34-17 to eliminate the Super Bowl champs. Only the Patriots and Broncos (yeah, Tom Brady and Peyton Manning) scored more points than Cincinnati’s 430 in the AFC. Only the Broncos outscored their opponents by more points in the AFC. And their 54 TDs? Second only to Denver. In other words, outside of the one led by the QB who just turned in the greatest passing season in NFL history, there may not be an offense you want to play less. Want more non-statistical proof that the Bengals could be in for another short run? Did you see the way the Chargers got into the playoffs? They needed about half a dozen dominoes to fall the right way over the last two weeks in order to get in. And even when they were down to the final domino, just beat a Chiefs team resting most of its starters in San Diego on Sunday, they needed overtime . . . and a fake punt that barely made a first down in OT . . . and a fourth-down stand in OT. Oh yeah, and a missed KC FG late in regulation which apparently should have been nullified by a Chargers penalty never that was never called and which would have given the Chiefs another chance to kick the Steelers into the postseason. And the Chargers’ record since losing to the Bengals on the first day of December? 4-0. They are correct. SD had more than 6 players on one side of the center on the line of scrimmage. That is a new rule and a foul. Hey, at least the Bengals have this: In January 1982, the Bengals hosted the Chargers in the AFC Championship Game, and beat Dan Fouts and San Diego 27-7 in the coldest game in NFL history (by wind chill, somehere south of 30 degrees below zero, with some reports putting it at 59 below). What you should know: Records mean nothing in this one. Actually, records seem to mean little in the NFC playoffs. After all, both wild-card games have the team with the better record playing on the road. That’s the beauty of owning a weak division . . . or is it the curse of playing in a mother of a division? • 2013 Week 1: 49ers 34, Packers 28 — Aaron Rodgers and Colin Kaepernick combine for 745 yards and 6 TDs through the air, Anquan Boldin has 208 yards receiving in his first game as a 49er, and the 49ers score the game’s final 10 points after the teams traded TDs in each of the first three quarters. The highlight of the game, though, was this late hit by Clay Matthews and subsequent retaliation penalty by Joe Staley. • 2012, Week 1: 49ers 30, Packers 22 — The difference with this one was that the game was played in Green Bay (the other two were in California). The 49ers got a 14-yard TD pass from Alex Smith to Randy Moss to open the second quarter, and a 63-yard field goal from David Akers to end the quarter, and never looked back from there. The lasting highlight for the Packers? Rodgers got a glimpse of his new receiving arsenal as relative unknowns Randall Cobb (75-yard punt return, 77 yards receiving) and James Jones (four catches, 81 yards, 1 TD) did some damage in this one. As for Kaepernick, he hadn’t yet gotten his chance and had just one carry, though he took it 17 yards. So the 49ers have the Packers’ number, right? Well, San Francisco may have that 2012 Week 1 win in Green Bay, but that was 72 degrees and under sunny skies at kickoff. This weekend’s early forecast for Lambeau? A high of 18 degrees, winds in excess of 10 mph, clouds blocking that sun, and . . . a 20-percent chance of snow. Beyond the weather and the history, there are a few other things making this THE game to watch on wild-card weekend. Rodgers — and Cobb — made long-awaited returns from injury in Week 17 on Sunday, and led the Packers to a dramatic 33-28 win-or-go-home victory at Chicago. Rodgers targeted Cobb only twice — and hit him both times, for a 7-yard score in the third quarter and the jaw-dropping winner, a 48-yard score on fourth down with less than a minute to play. Eddie Lacy, the rookie who entered the game with concerns over his injured ankle, carried the ball 21 times for 66 yards, and James Starks showed he is still alive, tallying 11 carries for 88 yards. As for the 49ers? They, too, needed late dramatics, beating the Cardinals in Arizona 23-20 on a 40-yard field goal as time expired. But San Francisco actually wrapped up a playoff spot after Week 16, and has looked like a team that means business for quite some time. The 49ers own the NFL’s longest current winning streak at six, during which time Kaepernick has thrown for 10 of his 21 TD passes this season and run for at least 20 yards in each game. Frank Gore may be 30, but he turned in another 1,000-yard season and scored nine times. Crabtree is back from an Achilles injury and Boldin, another guy in his 30s, also went over 1,000 yards receiving. This game may likely prove the toughest to call, but also the easiest call to make — an absolute must-watch to cap a wild season’s wild-card weekend.